In 1899 three Seattle visionaries (Henry L. Stevens, George Washington Daniels and Henry A. White) formed The Free Land Association for the purpose of establishing a utopian culture where their communal socialistic ideals could be promulgated. The Free Land Association platted a town made up of five-acre lots and on January 12, 1900 filed the incorporation papers for Freeland. This was nearly two decades ahead of the next incorporated town (Langley - 1918) on the south end of South Whidbey. Freeland is located at the head of Holmes Harbor in South Whidbey Island, 17 south of Coupeville. The site was platted in the 1800s by real estate promoters who called it St. Louis, but no town resulted. At one brief period the area was called Newell, which was the name of the nearest post office. It was intended that all the members of Freeland work for the common good, but the settlement failed to coalesce as a socialist community and the Free Land Association went bankrupt in 1920. According to the U.S. Census Bureau, in the year 2000, Freeland had a population 1,313. Perhaps, the most interesting event involving Freeland in the early days was a proposal to build a canal one-and-a-half-miles across South Whidbey Island. 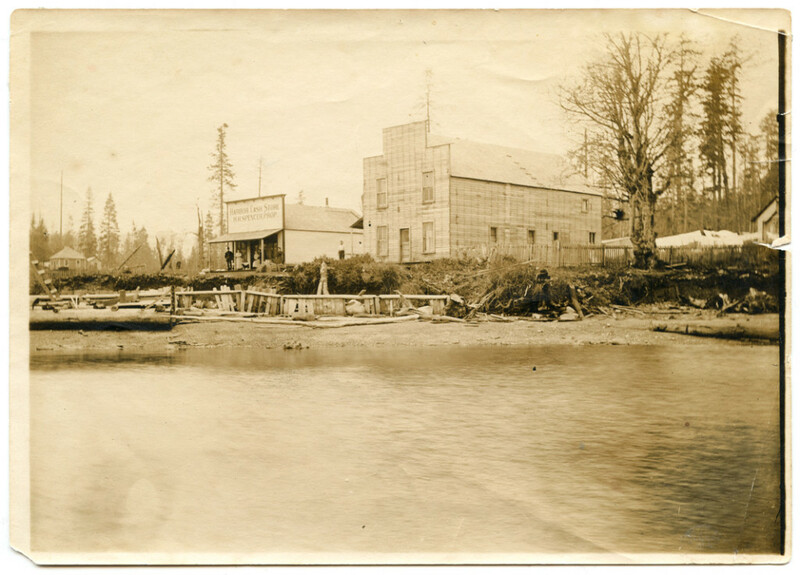 In the early 1900s, a venture capital group known as The Pennsylvania Syndicate, took options on nearly ten thousand acres of land between Holmes Harbor and Mutiny Bay on Admiralty Inlet. Their plan was to construct parallel train tracks and a sea-level, salt-water canal to allow ships and barges to be towed between Saratoga Passage and Admiralty Inlet, saving a trip around Possession Point. But anyone familiar with the area knew the savings in time and effort would be negligible and the project was abandoned. Mrs. Alma Gearhart organized the First Thursday Club in1902. 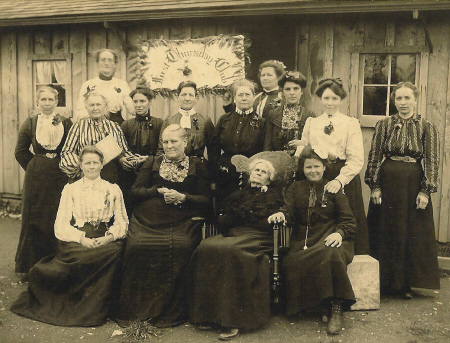 Their purpose was for “uplifting of women and welfare of society” and their motto was “Do your own thinking.” At each meeting members were prepared to give a reading, poem, book review, or a five-minute talk on “What I have been reading.” Topics of general interest were discussed such as: The harm of wearing long skirts. How to manage a husband. Medicine and the art of healing. Noted women of the world. What should be the attitude of earnest women toward their fallen sisters? and Property rights of women in the state of Washington. The club continued to meet at homes of members. Literary programs were prepared for each meeting. A department of News and Information was also conducted. In 1913 a mention is made of an emergency box. This contained sheets, pillowcases, and so forth, to be loaned to the sick or those in need. It also contained clothing, which could be given for the needy. The idea of building a community hall, “Freeland Hall,” was conceived in August of 1914 by the Freeland Improvement Club. A committee was sent to ask The First Thursday Club to help with the building/funding of the hall. The ladies club contributed $25 to the building fund with the stipulation that a separate room be provided in the hall for their use. The building was constructed by volunteer labor sometime after the spring of 1915. After construction of the Freeland Hall the Freeland Improvement Club’s history is unsure. It may have dissolved or played a minor role in the function of the hall with a manager as caretaker. The First Thursday Club continued to use the hall. In the 1940’s a “Community Activity Club” was organized. This group applied for non-profit status with the State of Washington and becomes legally known as the Holmes Harbor Activities Club on 15th of May 1958. In the following years the two organizations gradually evolved into one, known today as the Holmes Harbor Activities Club (HHAC), meeting on the first Thursday of the months October-December & February-May. Throughout the hall’s history it was used for community events, dances and club meetings. In recent years it has become known as a site for beautiful weddings and wedding parties. Over the decades HHAC has maintained and rented the hall for events. In 2001 HHAC undertook its greatest improvement program. From June 17th to July 17th the building was fitted with girders on the north and south sides using cables between them to strengthen the structure. A concrete foundation was put under the north side. The north wall was brought up to code with insulation and fire blocks. The horizontal siding had been removed, refinished with stain and reapplied in board and batten style. Then the French doors, transom and deck were added. At the same time the building was rewired by Island County. The interior kitchen was moved and remodeled. Both kitchens were converted to gas, the main kitchen being upgraded to a County Approved Kitchen. The improvements with the exception of the electrical were done using volunteer labor and donations; a plaque hangs in the hall honoring those who contributed. Later HHAC volunteers cleared ivy and underbrush to improve the park area on the north side of the hall. Holmes Harbor Activities Club continues to grow and prosper. Improvements to the hall have become their primary focus in the preservation of the Freeland Hall. HHAC presently rents out the hall for special events and holds their monthly meetings on the first Thursday of the month.